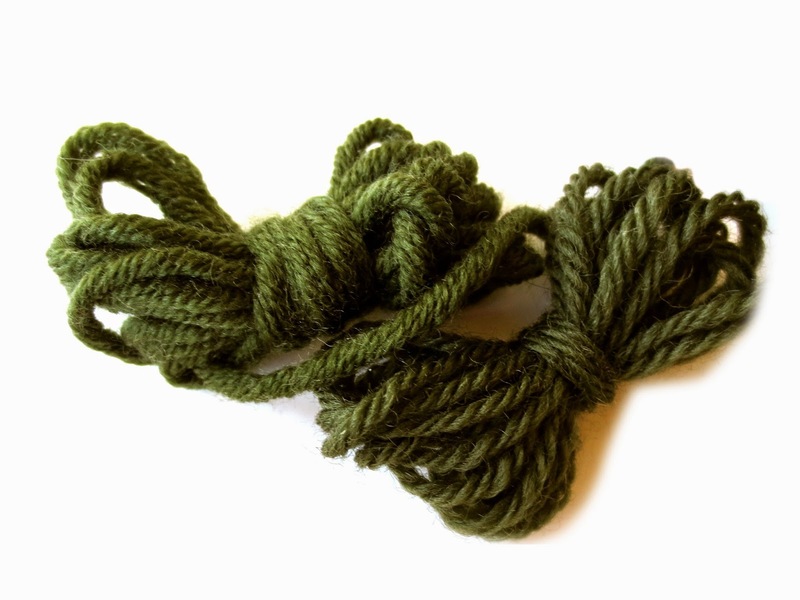 Fake Latvian Braid: Why a bind-off version? The previous post introduced Fake Latvian Braid (FLB). 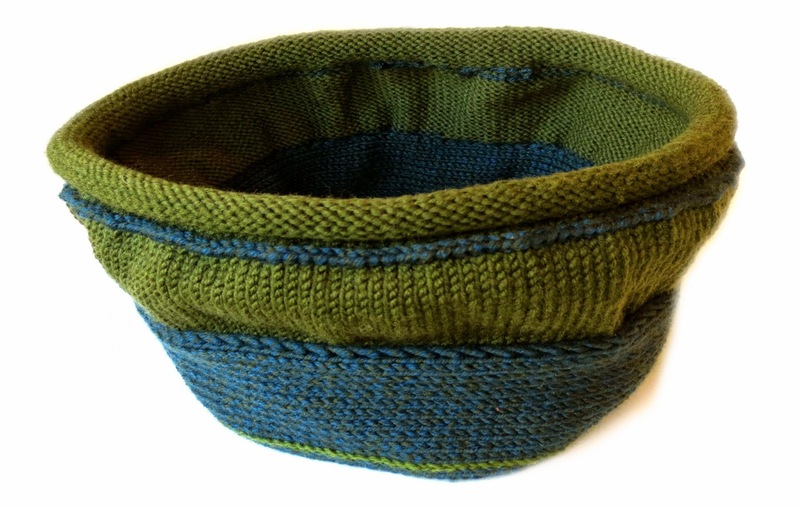 Today's TECHknitting shows "deco bind-off FLB." Although they look the same, they're worked differently, and are good for different things. Regular FLB is perfect for adding color afterwards, while deco bind-off FLB turns out to be very good for unifying and protecting scrap projects knit as-you-go. 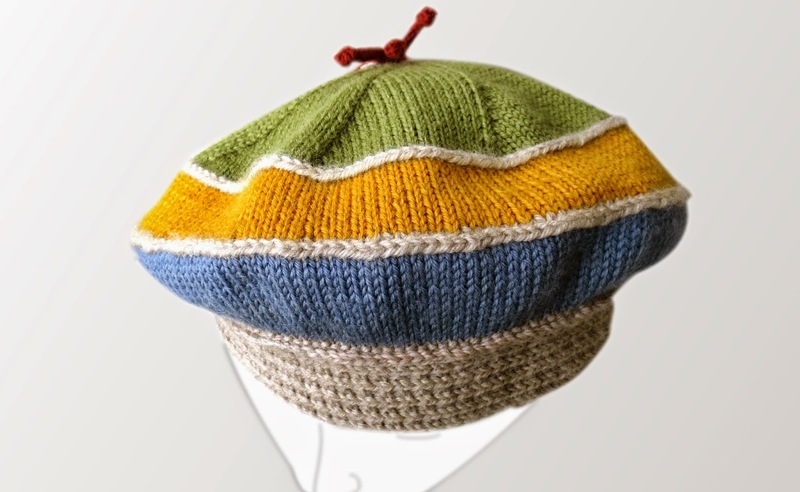 Those horizontal beige lines on this tam? Those are today's trick worked on a scrap project. 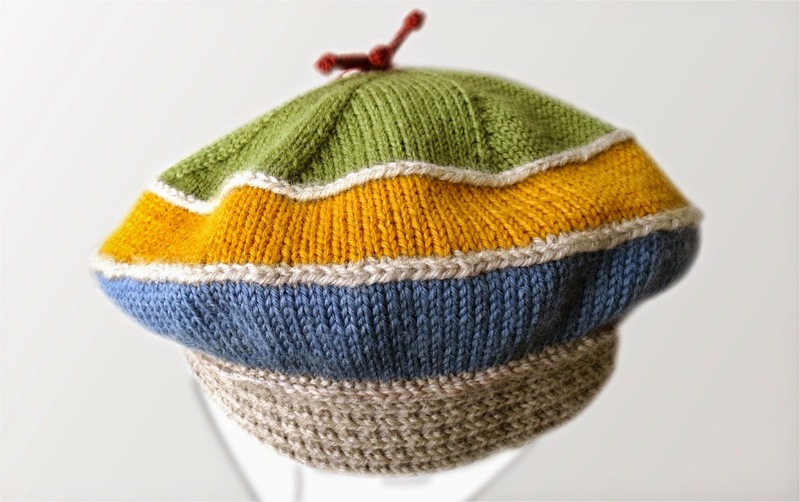 This tam was knit over the course of more than a year. Each stripe was added as the scrap yarn became available, then bound off, waiting for the next stripe. To my mind, this approach has advantages over the usual kind of scrap knitting. 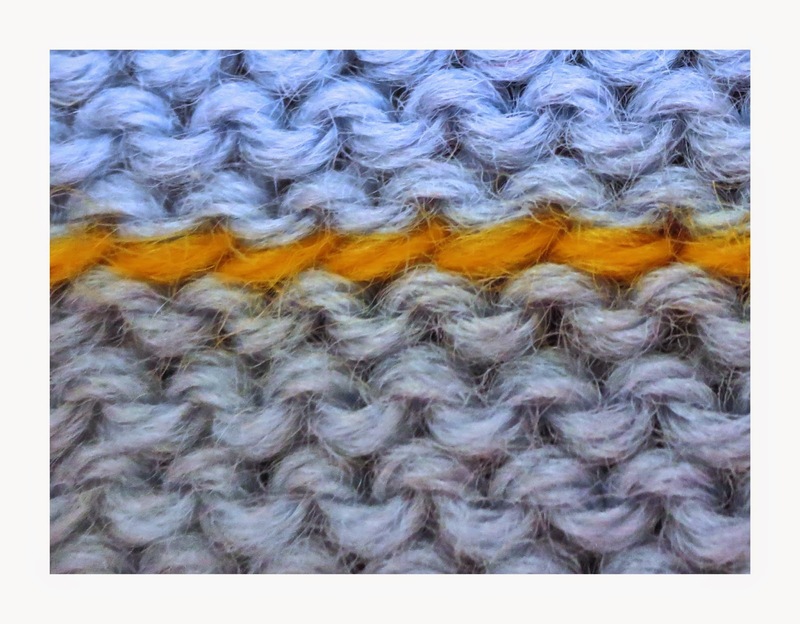 The strong horizontal feature added by bind-off FLB separates stripes of different colors (and even different yarns) while at the same time unifying the project by repetition of the horizontal element. Scrap projects look less "afterthought-y." Because each stage of the project rests in bound-off condition, no needles are parked in the work, out of commission. No loops are left trembling at the edge, getting shopworn on a stitch holder or yarn while waiting to be transferred back to a needle. The project is neat, tidy and secure, ready for the next stage. IMHO, knitting up what you have, then binding off to await more scraps is a big improvement over having scrap yarn laying all over the place, waiting for "some day." It makes a great take-along for traveling (grab any bag with a partly-knit project, waiting to go) and a good hiatus between larger projects. 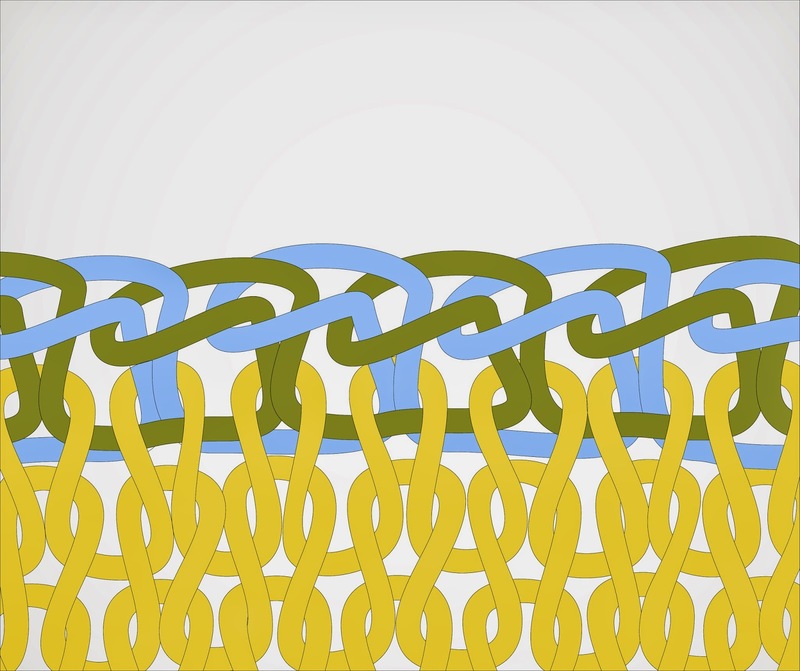 Deco bind-off FLB is a nothing more than a chain bind-off, followed immediately by a method of stitch pick-up through the chain which forces both arms of the chain to the fabric surface. In other words, it is a decorative contrasting color bind-off in the middle of a fabric, followed by picking the stitches up again. 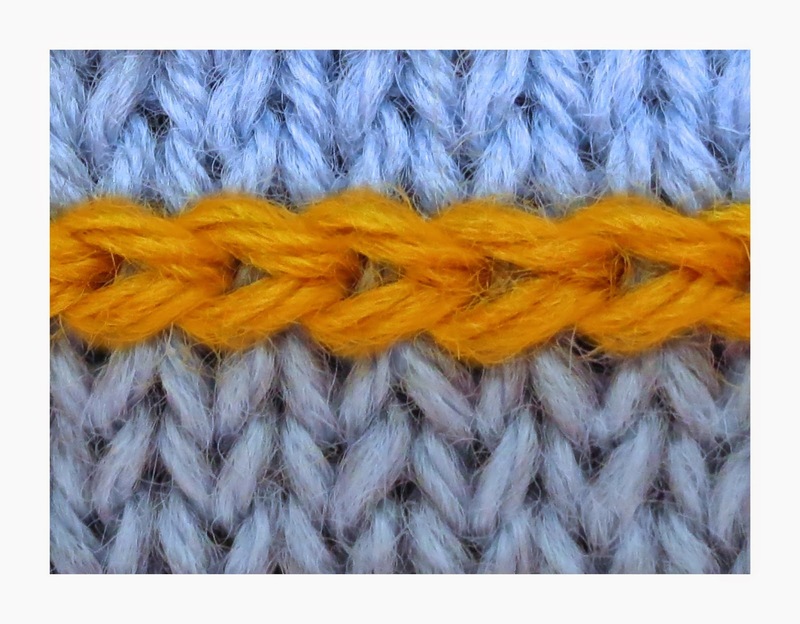 This bind-off/pick up combo creates the decorative horizontal Fake Latvian Braid in the fabric, and it looks like regular FLB because a knitted chain bind off and a crocheted slip stitch are identical on their business ends. 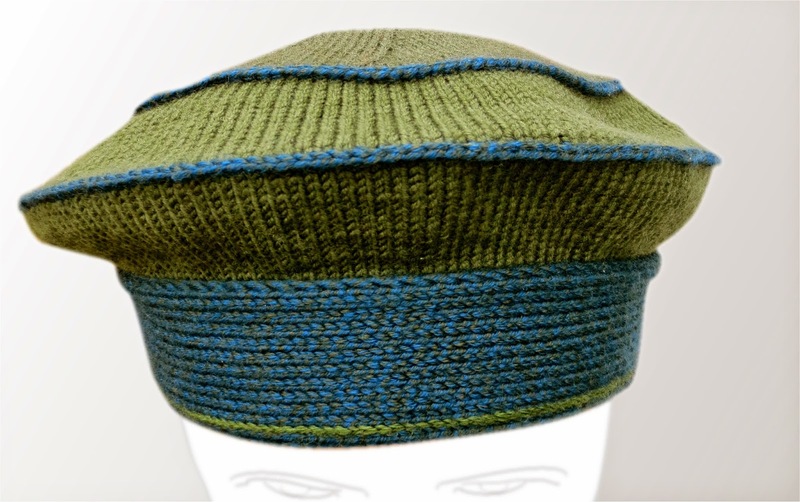 A contrasting color deco bind-off FLB is worked over 2 rows or rounds, each with its own step. Both steps are usually worked using the same color, but it there are alternatives for step 2, pick up, which are discussed more thoroughly below, under two-color FLB. Work a chain bind off. The result is as below. 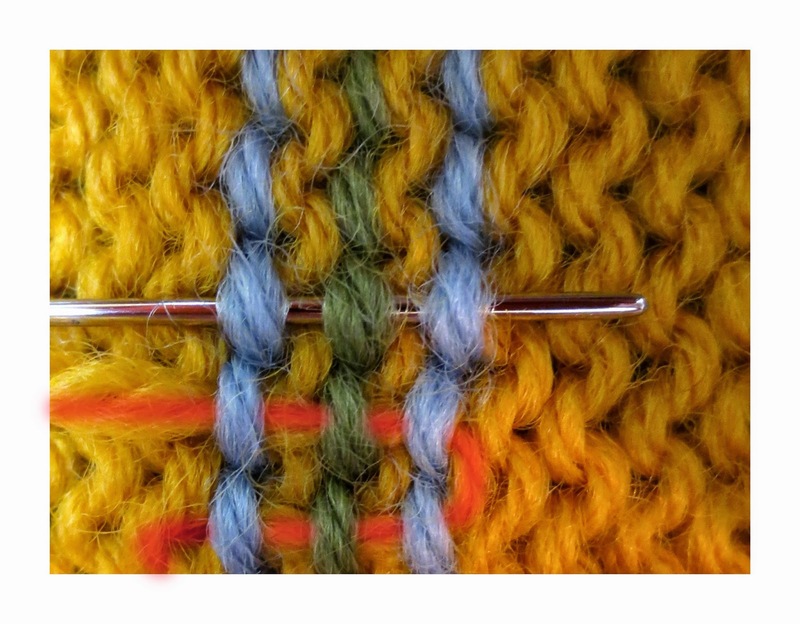 Create live loops above the bind-off FLB by picking up stitches through the bind off, this is usually done in the same color yarn as was used for the bind off, but, again, there are more alternatives given below. The reason to use the same color yarn is so that the bottom portion of the picked-up stitches don't show through the bind off as contrasting color icky dots. I have highlighted with bright red dots on one stitch, the bottom portion which might show. I made the pick up stitches a slightly darker blue so you could SEE them--you are free to imagine them to be the same color or different. This bears emphasizing: because the arms of the chain are going to be the decorative element, both arms of the chain must be forced to the surface of the fabric. Therefore, the stitch pick up is done under BOTH arms of the chain bind off, as illustrated above. 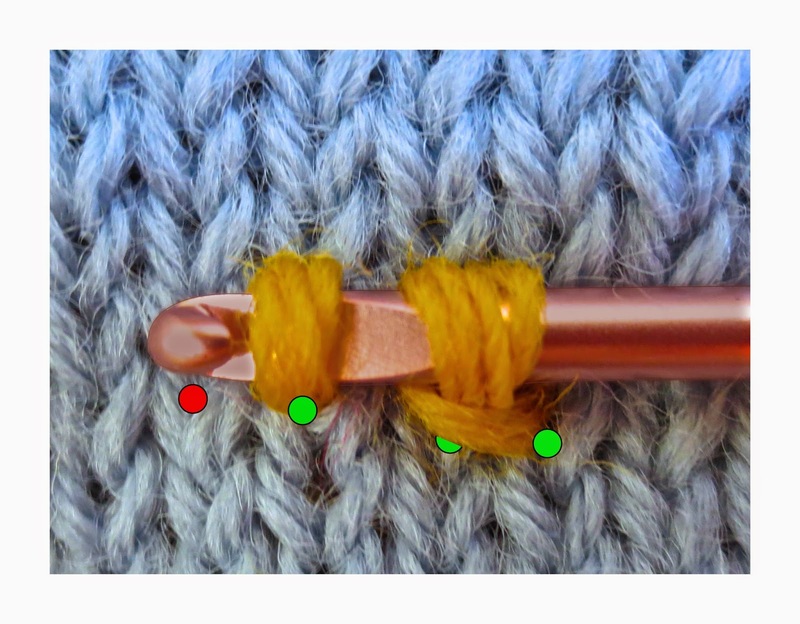 In the above illustration, the crochet hook is shown picking up the stitches through the bind off, and then the stitches are placed on the knitting needle, and this is a good reliable method. However, for the impatient, it is actually faster to pick up the stitches directly with the knitting needle, if you have one with a sharp-enough point. 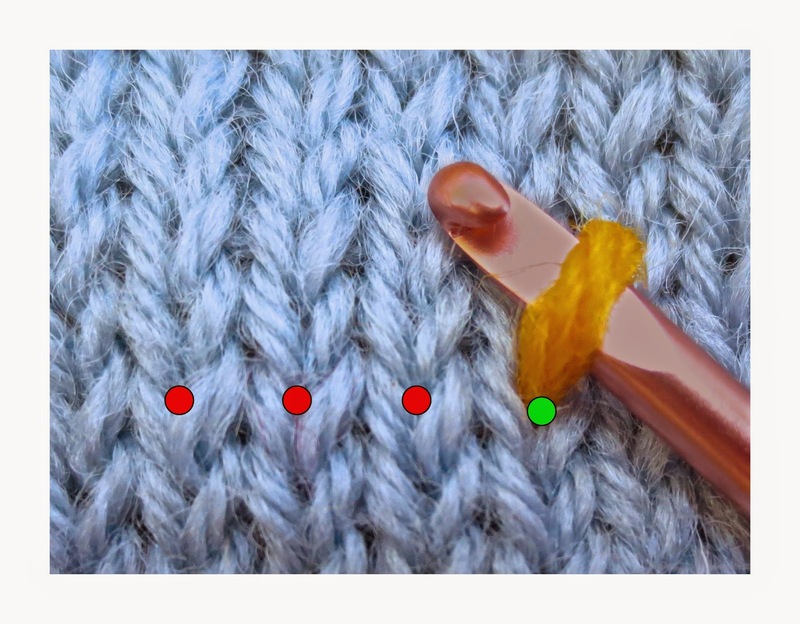 This kind of knitting-needle pick up is easier if you hold the knitting needle on the inside of the fabric and draw the stitches through the fabric towards you. After step 2, you switch to the color for the next stripe. 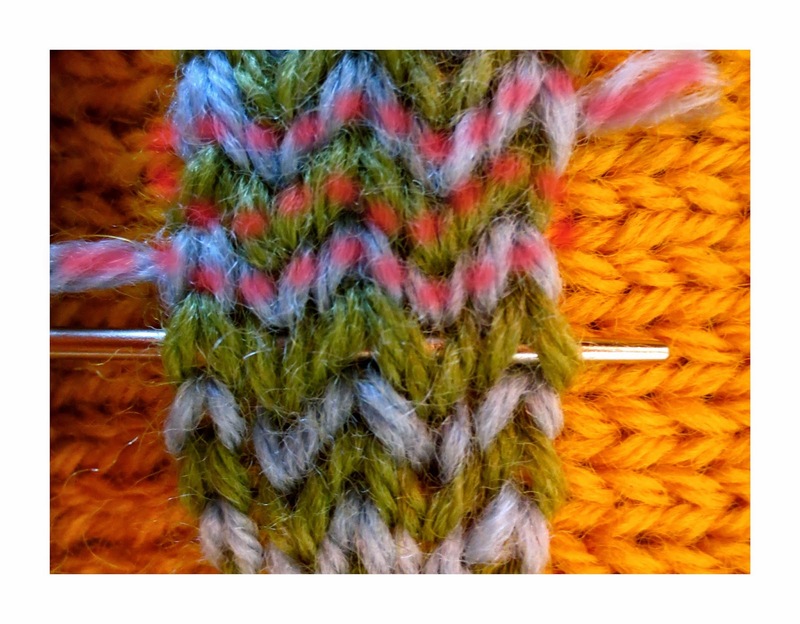 To prevent a jog where the color changes, work this first row/round of the new colored stripe as a jogless join. in circular knitting, assuming you bridged over the gap, you wind up with the same number of stitches as you started with. in flat knitting, you wind up with one stitch less and therefore have to fudge in an extra stitch somewhere to correct the stitch count. 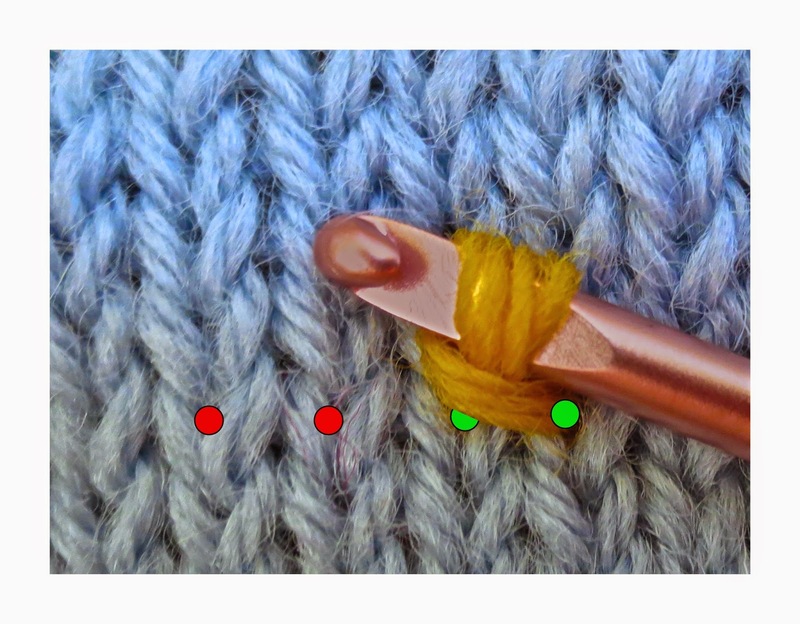 As shown in the above illustrations, the yarn is held IN BACK for the bind-off, and in FRONT for the pick up. For flat work you can use a continuous running yarn for both, no problem because the cross-over from front to back can take place at fabric-edge, there to be hidden in a seam. 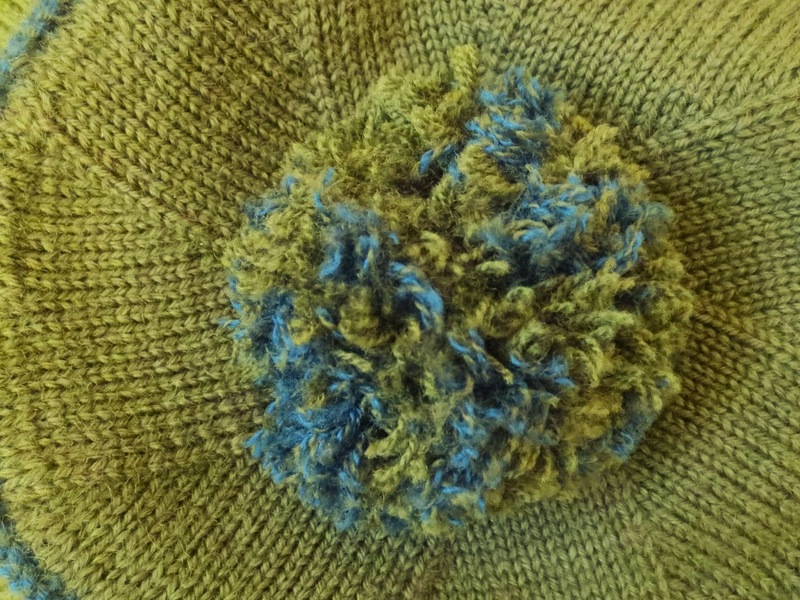 Using the same yarn for both reduces the number of tails to work in. By contrast, on circular work, you cannot invisibly cross over from back to front, but must cut the yarn after the bind off, leaving those tails to the inside. You then begin the pick up on the outside, and afterwards draw the pick up tails to the fabric back, and work them in there. This creates 4 individual tails which have to be worked in. If you ended your first stripe, and begin your second stripe in this area, too, you will have those tails too--a total of 6 tails to work into the same small area. However, help is at hand. If you followed the hint in Pro-tip 1, your bind-off is a complete circle, not a coil on a spiral, as most circular knitting is. 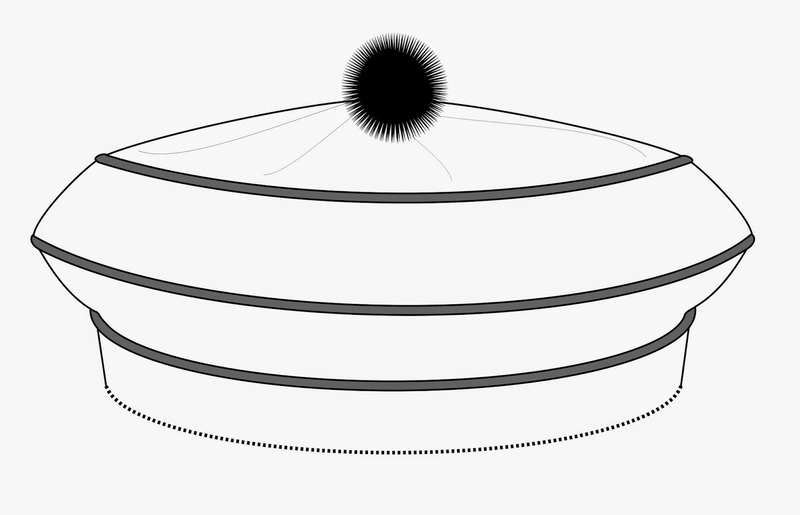 The pick-up round is also a closed circle, and for the same reason. Therefore, it is possible to offset the tails by simply beginning the bind-off a few stitches over--either way--from where the stripe ended. 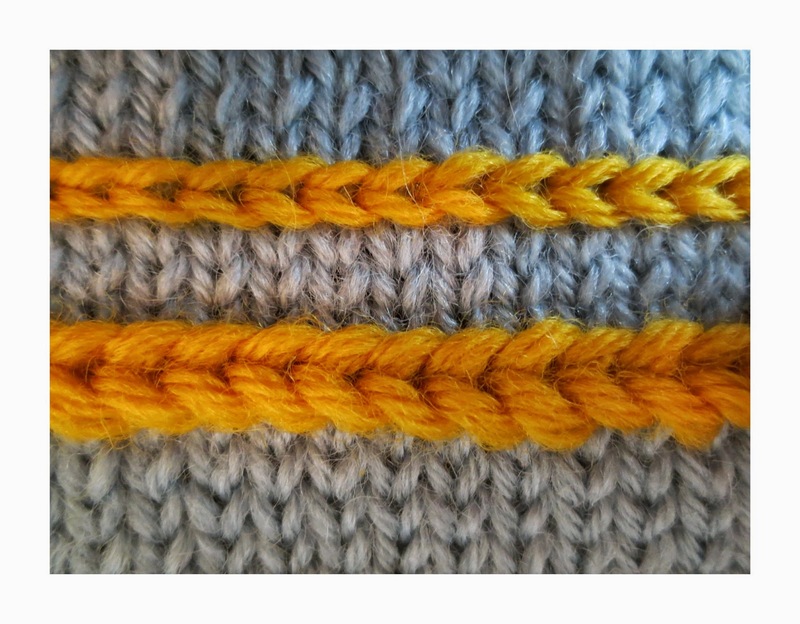 Similarly, you can offset the pick-up from the bind off, and the start of the new stripe from the pick-up. All these offsets gives more room on the fabric back for tail work-in. 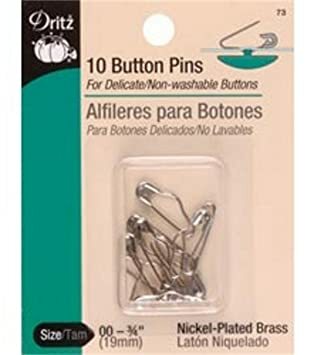 For the actual working in of the tails, I suggest the skimming method, either with a sharp sewing needle, or with a knitpicker. 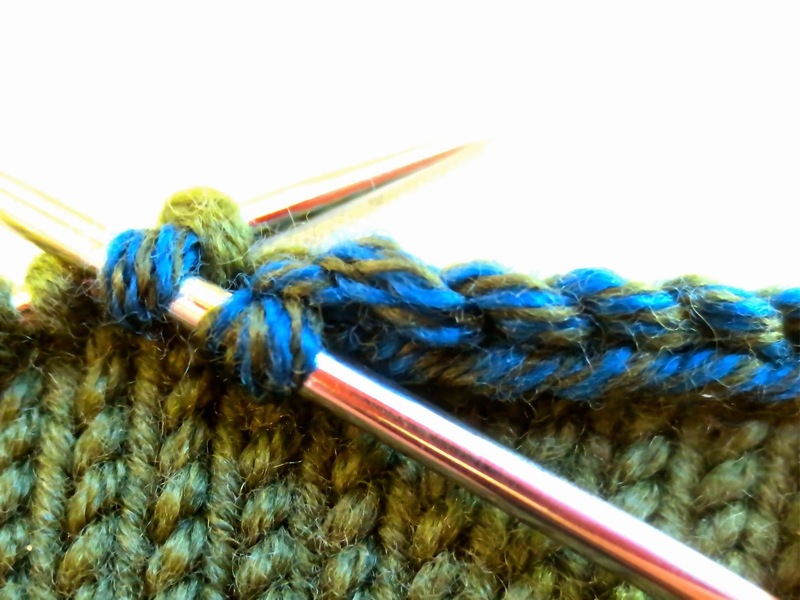 As with single color bind-off FLB, work a chain bind off. However, like two-color regular FLB, you have to alternate the two colors by holding both colors on the fabric back, then drawing from each, alternately. The result is as below. 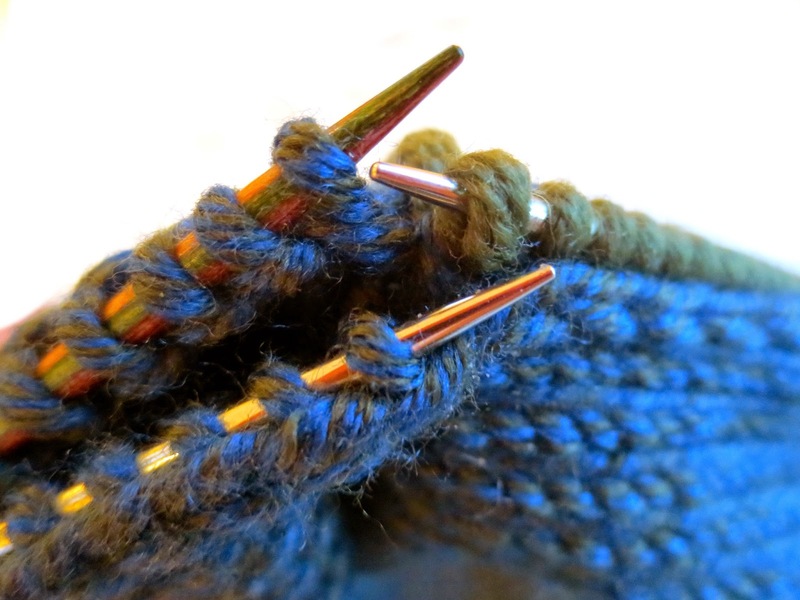 As with one-color deco bind-off FLB, pick up the stitches through the chain bind off. However, now the question is: in which color shall you pick up? It is possible to pick up in two colors. Upside: icky dots tamed. Downside: this adds bulk, because the yarn color not in use is stranded behind the already-bulky two color bind off. Pick up using the color of the stripe below. Upside: no icky dots. Downside: possible show through on the other side of the deco bind-off FLB, in other words, the first row of new stripe. Pick up using the color of the new stripe. Upside: no show-through above the FLB. Downside: possible show through (icky dots) all along the bottom of the FLB. For choices 3 and 4, two tricks can minimize the downside risks. 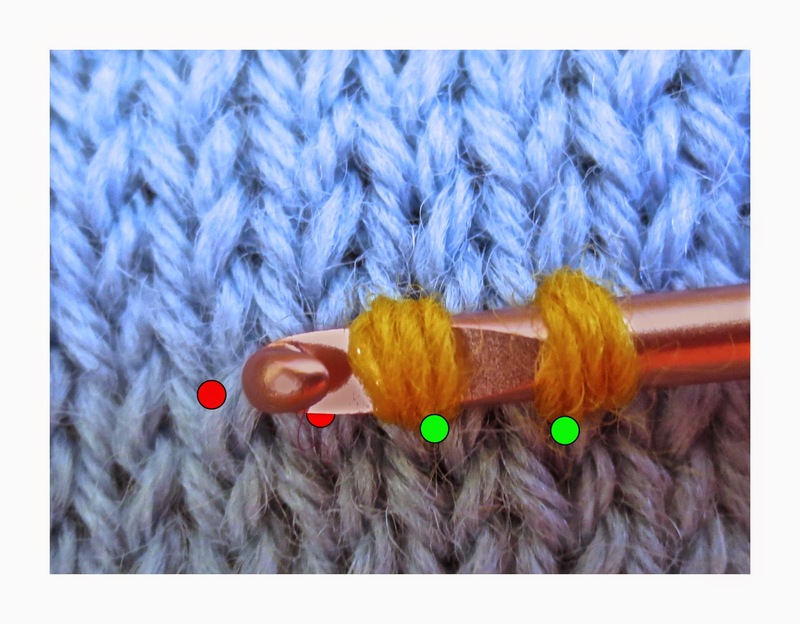 First, if you use a thin small needle to make the pick-up loops quite small, the wrong-color stitches of the pick-up may hide behind the larger loops of the FLB. Second, working the FLB quite large and loose, or in a bulkier or even doubled yarn further increases the chance of hiding the icky dots. Besides the Lazy Knitter tam, this trick is great for scrap projects or all kinds--afghans, scarves. As stated above, it's neater, too: instead of accumulating scraps of yarn all over, you knit them up as far as you can, then bind them off, waiting for more scraps to accumulate. Your project thus sits, nicely bound off while it waits. And again, this trick also brings unity to scrap projects: if you always use the same color to separate the stripes, the project looks more unified, as with the tam in the opening photo. 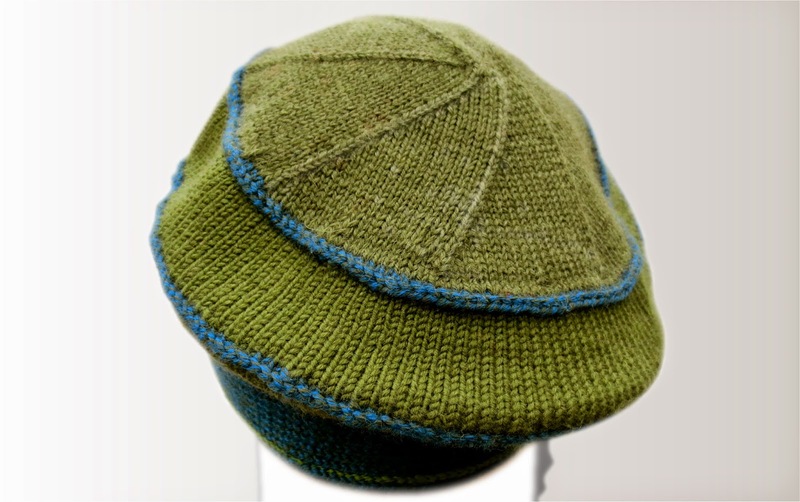 Children's sweaters are a special case of bind-off FLB: bind-off FLB offers an easy way plan ahead for "growing" (lengthening) children's sweaters. Because kids tend to grow longer before they grow wider, adding length can add years (or at least months!) of wear to children's sweaters. To plan ahead in this way, either start bottom-up sweaters and sleeves provisionally, then bind them off in a contrasting, decorative color OR work the garment top-down and work a chain bind off in the cc. The point is that, with both of these tricks, you wind up with a chain bind off at the bottom of the garment. Next, pick up your ribbing stitches through the FLB. For now, you work the ribbing on these picked-up stitches, then bind off the ribbing off any way you like. 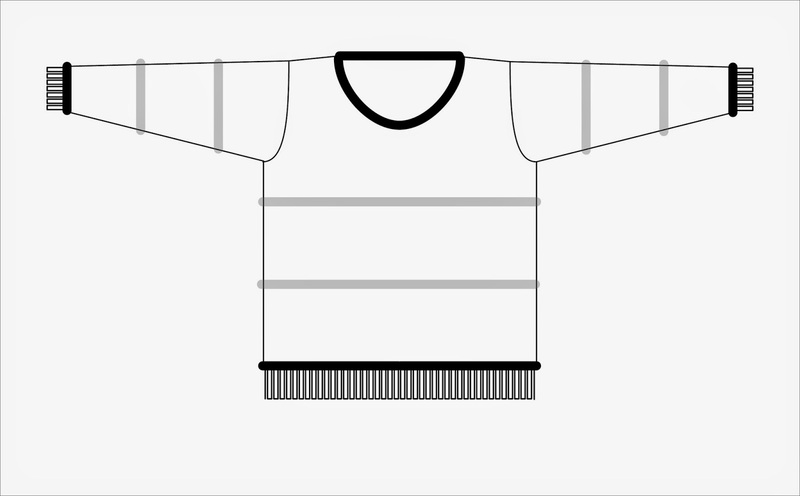 Below is a schematic of a child's sweater with an FLB bind off (heavy bar above the ribbing). The schematic also suggests that the entire sweater can be made as a deco bind off FLB scrap project (lighter gray bars). When the kid outgrows the sweater, snip and unravel the bottom band/cuff ribbing. In my experience, this yarn is so worn it gets tossed, so pull out all the ribbing, or nearly all: you could choose to leave the first round, where the stitches were originally picked up through the FLB. If you do choose to leave the first round, I suggest tinking quickly, and remounting the stitches via the trick shown in this video. Otherwise, just pull the entire ribbing out and do a new pick-up. Switch to your new color (or more of the same color if you saved some) and work a new stripe to length. Again bind off with FLB, pick up for the second ribbing as you did for the first, and you'll have a longer sweater (and one waiting for you to work this trick maybe one more time). 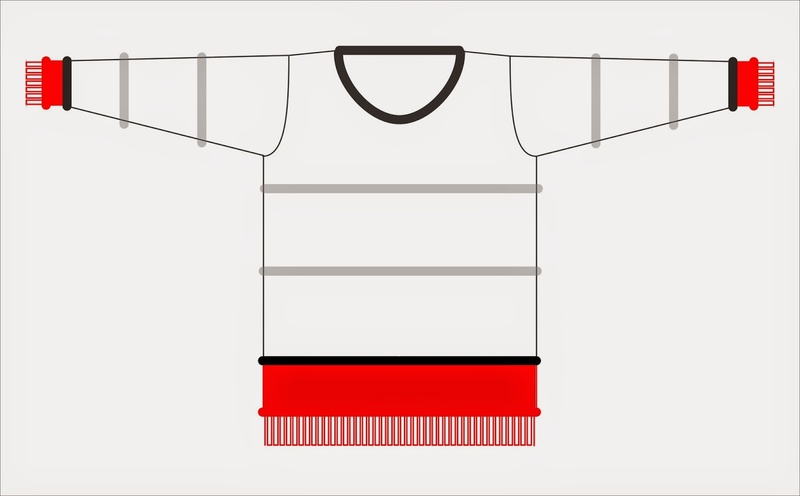 The new stripe and ribbing are shown in red, below. Work the first round or so past the pick-up in stockinette, then switch to ribbing. A row (or even more) of stockinette before the ribbing begins helps protect the FLB from the puckering which would otherwise propagate upwards from the ribbing's corrugations. The advantage of using bind-off FLB over snip-lengthening is that the horizontal line of the bind off disguises the worn fabric from the new fabric to be added, and adds a decorative element to the lengthening which makes it look like less of an afterthought--especially an issue if you use a different color or even a different yarn. It also makes reworking of a sweater for a younger sib a whole lot easier. 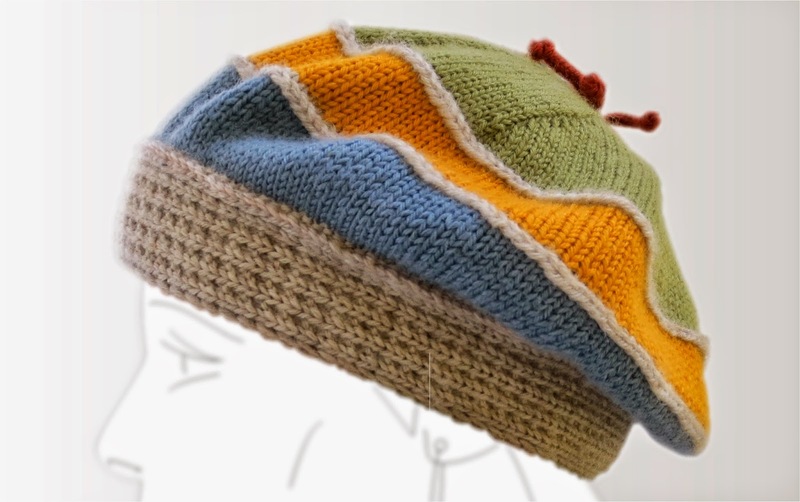 Naturally, ANY striped garment--adult sweaters, for example, can also be made via this trick. You work away at them interspersed with other projects, until the scraps are used up and the garment finished, sometimes over the course of years. 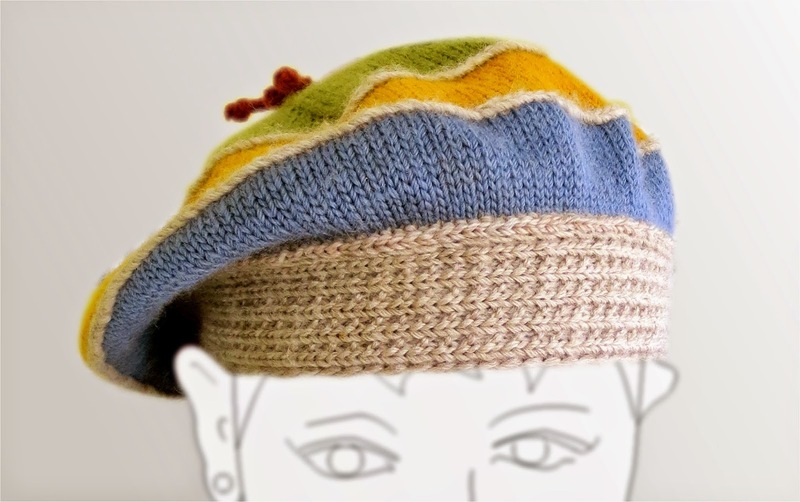 As promised, the very next installment of TECHknitting blog will feature a recipe for my go-to deco bind-off FLB scrap project, the Lazy Knitter's Scrap Tam. 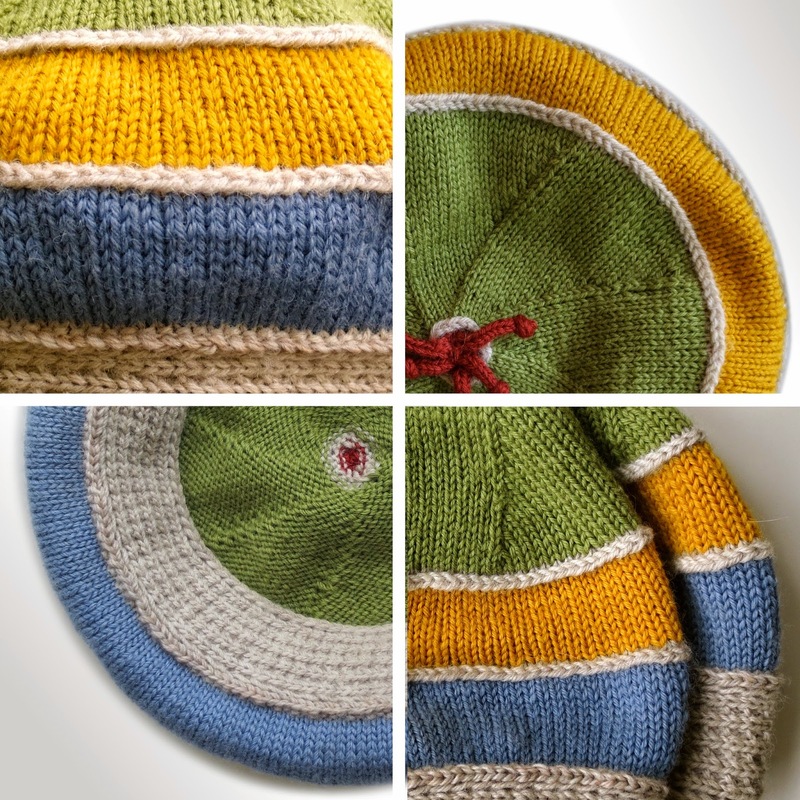 Not only does this tam feature the bind-off FLB, but there is a minimum of stitch counting and even less measuring, which is why its first name is "Lazy." Today's post: a form of horizontal surface decoration added with a crochet hook, a trick I call Fake Latvian Braid (FLB). 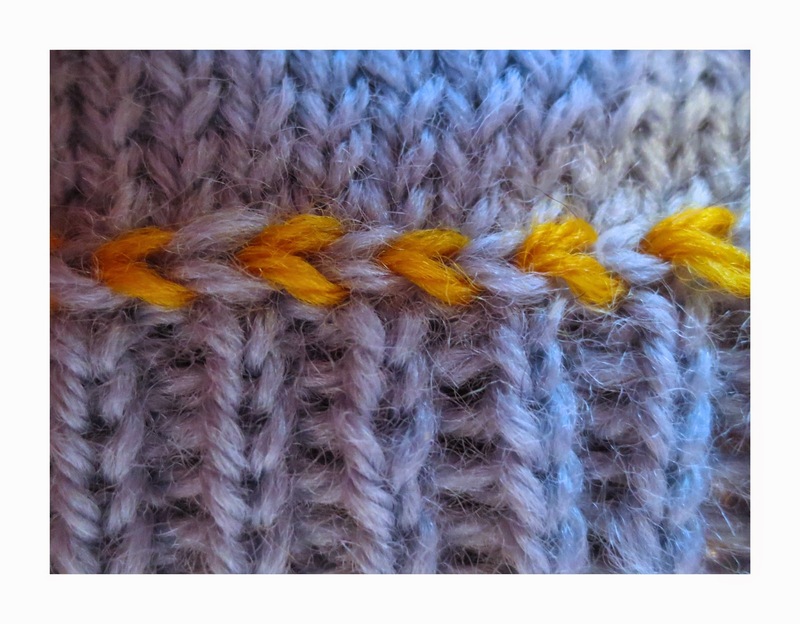 Here is a photo of an easy little 3-row high teaser, but this barely scratches the surface: FLB can be used for many far more intricate braid patterns as shown lower in this post. Real Latvian Braid looks like a bar of knitting worked at 90 degrees to the rest of the fabric--a sort of horizontal trim. It can be worked in a single color, or in two colors, as on this mitten from the gallery, with its two lines of handsome black-and-yellow braid. Real Latvian braid is a form of surface decoration created by a yarn stranded onto the fabric surface as the yarn travels from one stitch to another. It isn't difficult to do, here's a good video. Yet, whenever I see it, it reminds me of a similar-looking stranding you get from the slip stitch. 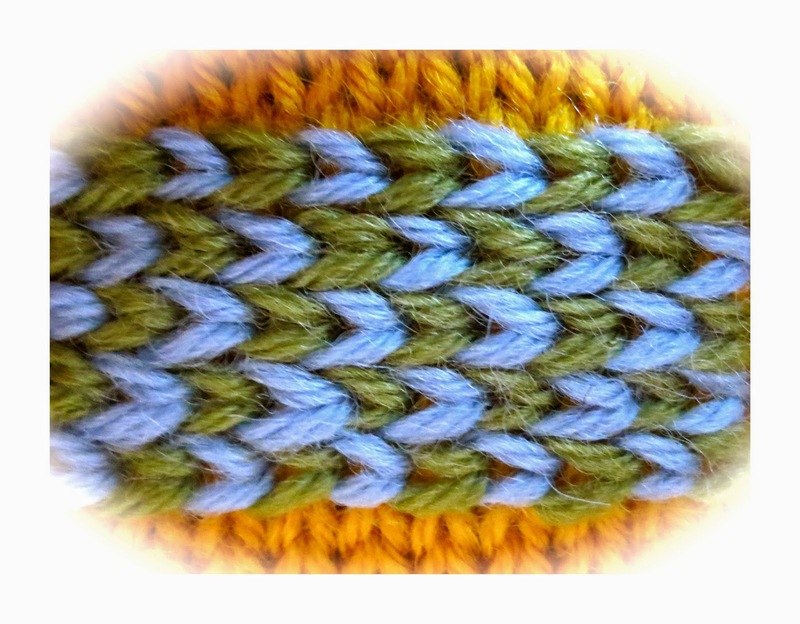 So, with a bow to tradition, here's a TECHknitting version of Fake Latvian Braid (FLB) based on slip stitch. Just like real Latvian Braid, FLB can be located anywhere in the fabric--so close to the cast-on that it look like it is the cast on, or in the middle of the fabric. Also like the real thing, rows of FLB can point right (tip of each stitch at the right) or point left. Unlike real Latvian Braid, which is knitted-in, FLB is a form of surface decoration done after the knitting is complete, making it easy to install, easy to remove, easy to re-locate. FLB nothing more than a crocheted slip stitch worked through a knitted fabric so that the two arms of the chain appear on "public" face of the garment. The one-color version of this is the simplest. It is done just as you would use a slip stitch to stabilize a knitted fabric with the exception that it is always worked from the front face of the fabric, the point of the exercise being the chain decoration. Step 1: Holding the cc yarn at the knitted fabric back, insert the crochet hook into the very middle of your target stitch--right between its two arms. Catch the cc yarn on the hook and draw the loop to the fabric surface, as shown below. This creates a loop. Step 2: keeping the loop around the barrel of the hook, insert the hook between the arms of the next stitch in the same row. Again catch the cc yarn, again draw a loop to the fabric surface, as shown below. This creates a new loop. Step 3: draw the new loop through the old loop. Step 4: repeat steps 2 and 3--as you draw up a new loop, the loop further down the barrel becomes the old loop. How do you actually DO the FLB without flipping the fabric back and forth? If you don't flip the fabric back and forth, how do you work with one hand behind the fabric? FLB can be made rather flat, by using the same yarn for the FLB as for the garment fabric (thinner top braid). Or, you could make the FLB an almost structural element by using a heavier yarn than the one used for the background fabric, or even a doubled yarn (thicker bottom braid). FLB can also be worked along the top of ribbing. The great thing is, when worked along the ribbing/stockinette transition line, FLB combats flip! 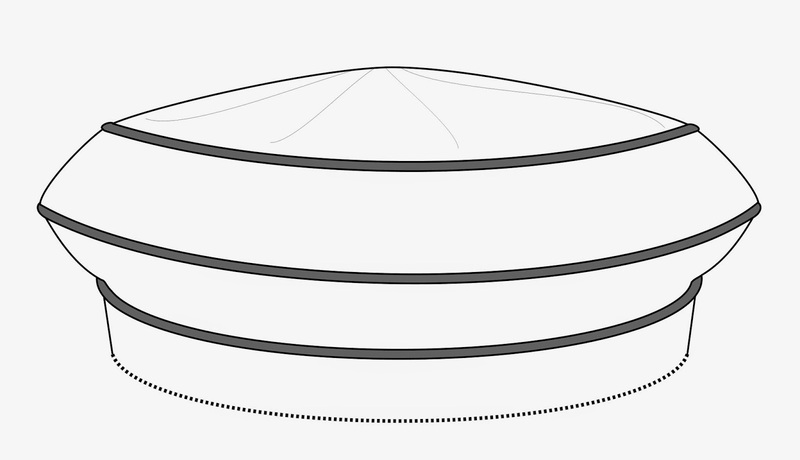 In truth, I rarely PLAN to work FLB along a ribbing, mostly I trot this trick out to combat band-flip when it shows up--a true "afterthought" use. 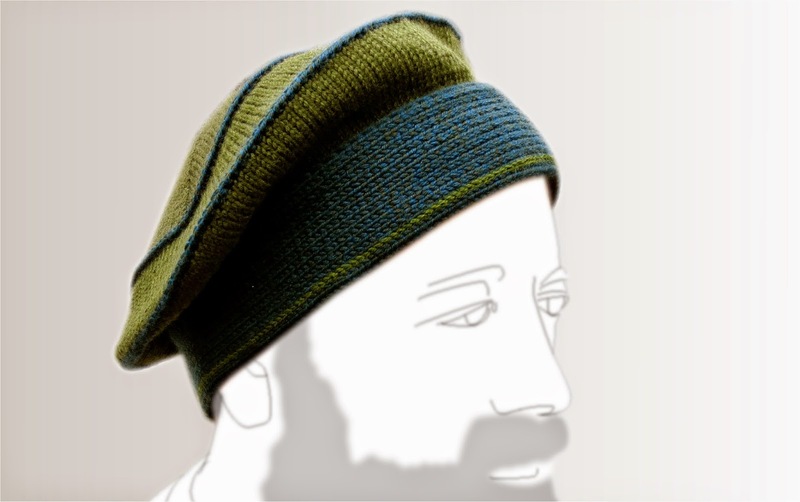 1) If you want to combat flip at the ribbing/stockinette transition, but don't want the decorative effect, make the FLB in the same color and no one except another knitter will ever notice. So far, all the FLB samples shown have been worked in a single color. The two-color version is not a lot more complicated. 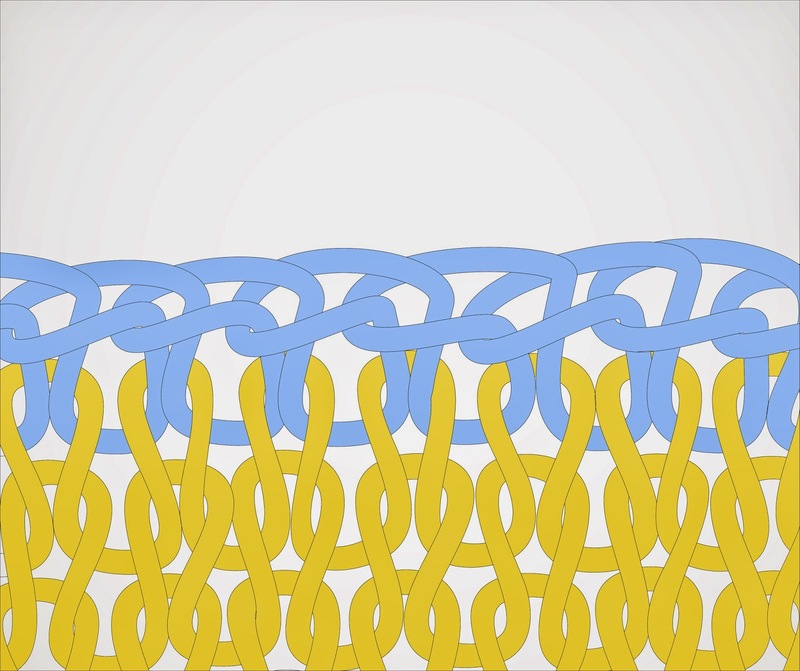 It is achieved by holding two different-color yarns on the fabric back, then alternately drawing a loop of one color through a loop of the other color. 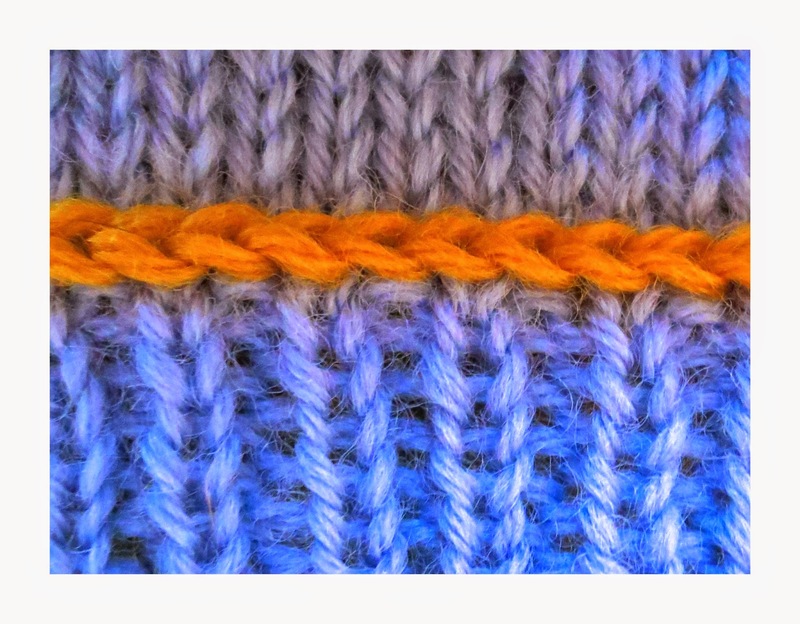 Below is a single line of alternate-color FLB at the top of a ribbing. To avoid having the running yarns twist and tangle around one another (as they always do with real Latvian Braid), hold each yarn in a consistent location (one above and one below) and draw the yarns alternately and directly. 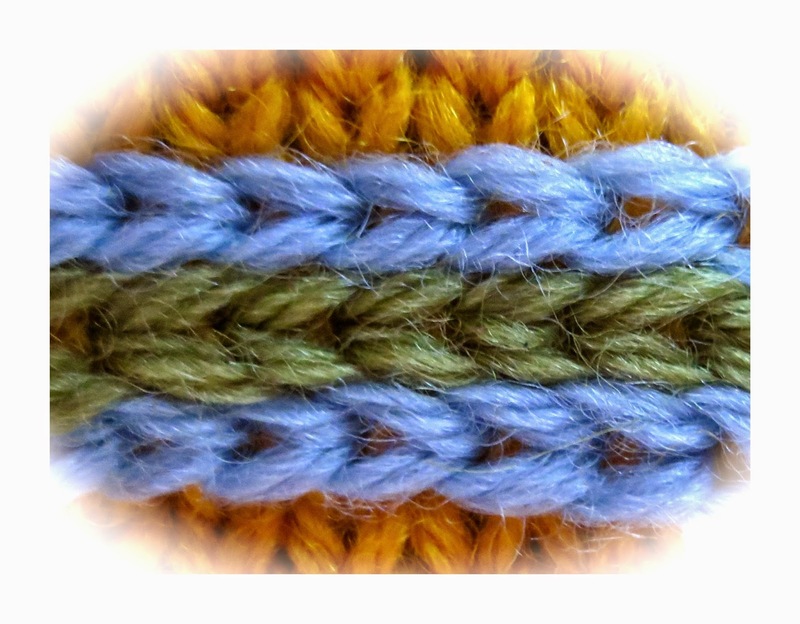 Working a three- or more color FLB is certainly possible, also, but with each color added, the amount of bulk at the braid-line increases substantially. 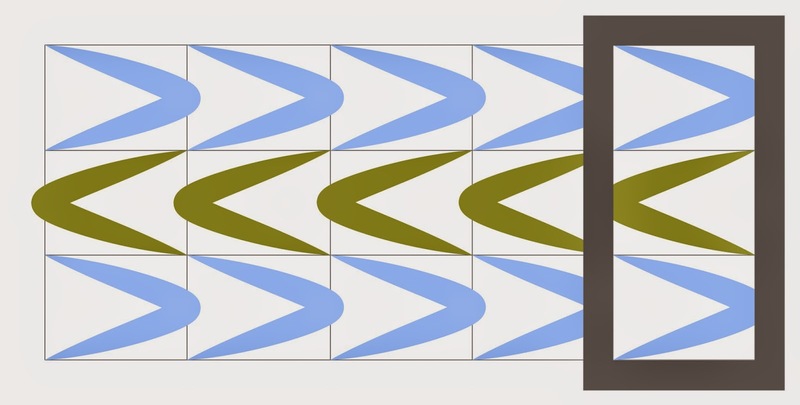 Here's the ultimate expression of this trick, the big payoff: intricate braid patterns made by stacking multiple rows of FLB worked in opposite directions or the same direction, in the same colors or different. 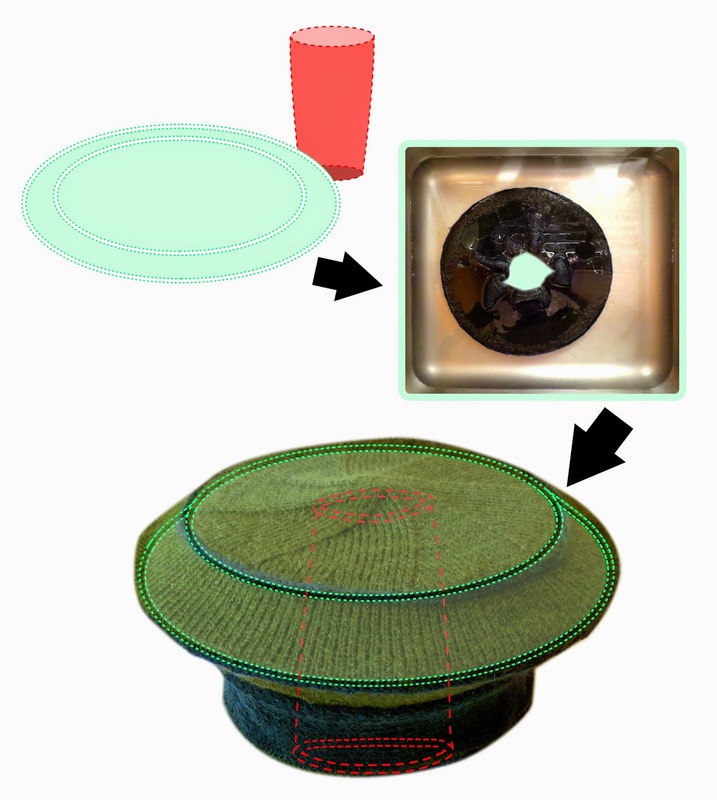 All sorts of woven-looking "trim" effects are possible from stacking, below are schematics and photos. 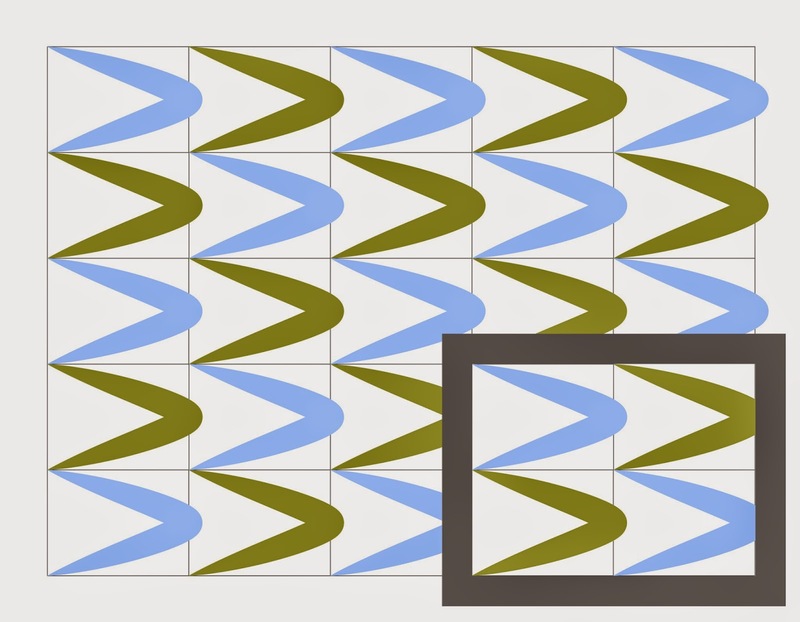 The dark box in each schematic shows the minimum stitch and row repeat. 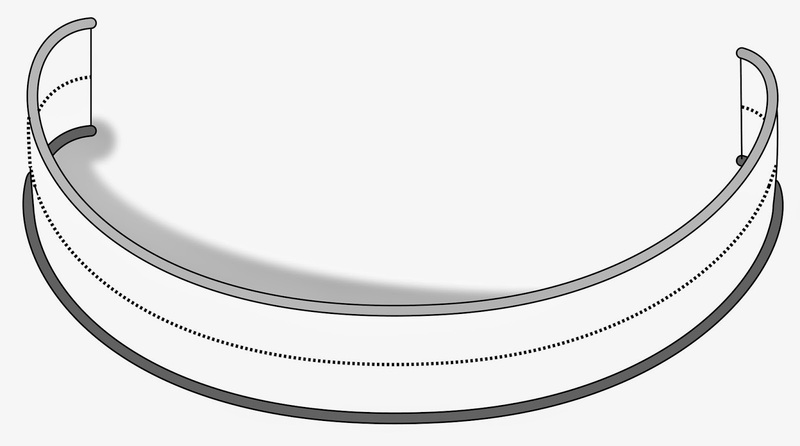 First up is one of the simplest--the post opened with this trim, and here is is again, this time with its schematic. 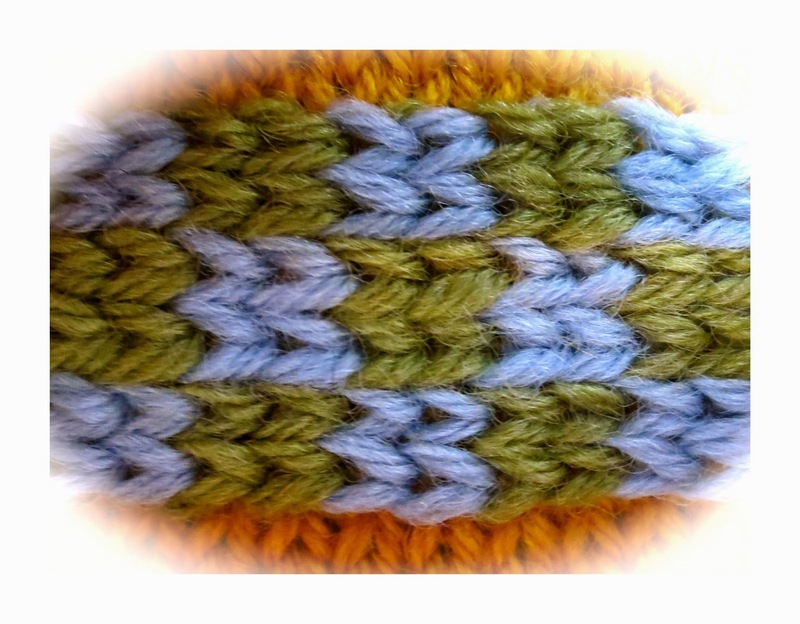 This is a simple 3-row stacked design composed of alternating rows of solid color (so it's called "alternating-color-row" trim) with the middle FLB made in the opposite direction from the top and bottom ones (it's called a "2-way trim" because the rows of FLB go in two different directions). This trim is composed of 3 rows of FLB, each worked in the same direction (which is why this is a "1-way trim"). Each FLB is made of single stitches of alternating color (which is why each FLB is called 1/1). The adjoining rows of FLB are stacked so that the colors line up in the columns (which is why this one is called "alternating column" trim). This trim is like the one just above with two exceptions: There are 5 rows of 1/1 FLB instead of 3, and the rows stacked so the colors alternate in the columns to create a checkerboard. 2/2 checkerboard trim is just like 1/1 checkerboard, except that there are 2 stitches of each color, and each square is two rows high. This trim is the two-way version of 1/1 checkerboard trim: in this trim, the second and fourth rows go in a different direction than the first, third and fifth. 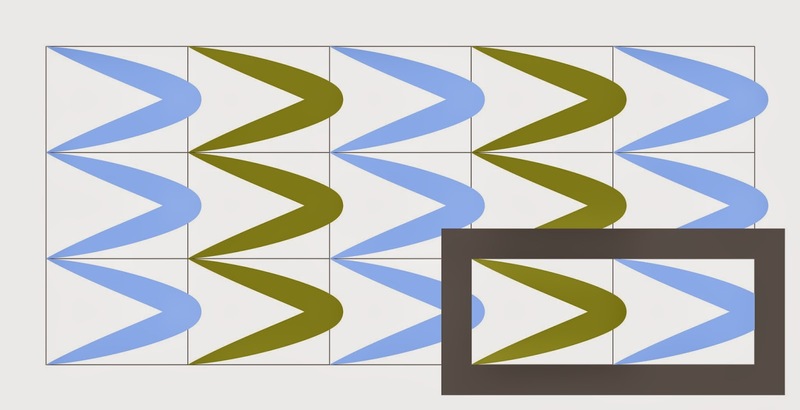 In other words, the same distribution of stitches either makes a checkerboard or a zig zag, depending whether the design is 1- or 2-way. You'll notice a little red-colorized tail of yarn at the bottom of the trim, the explanation is in pro-tip 3, below. Five row 1/1 zig-zag trim (2-way). Note the red colorized tail at middle bottom. This trim is the 2-way version of 2/2 checkerboard. These examples are only a tiny sample. 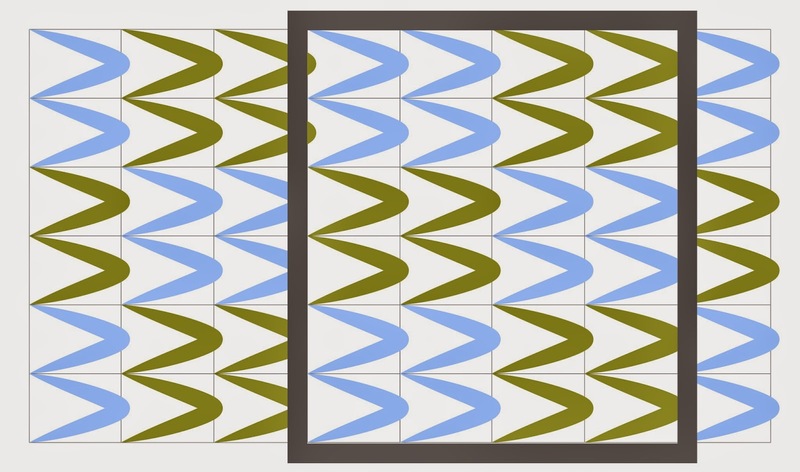 For one thing, these are all simple two-color geometric repeats. 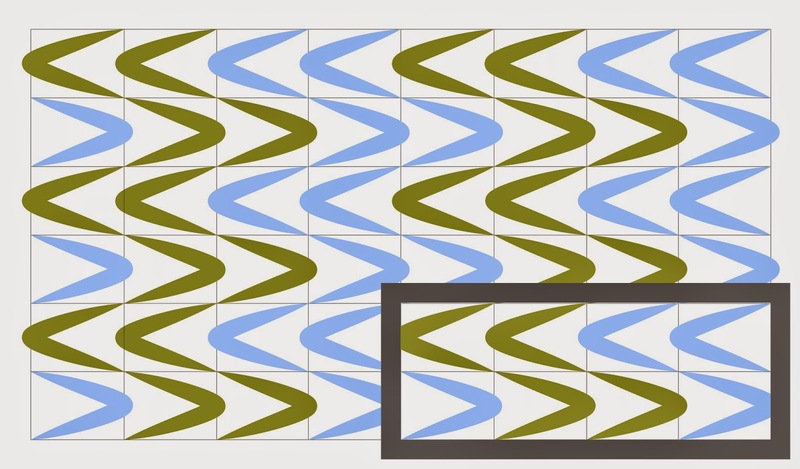 Changing colors between rows or adapting irregular patterns opens more possibilities. Further, as Anon has pointed out in the comments, it is also possible to switch direction with FLB mid row--a thing theoretically possible with real Latvian braid, but much easier with FLB. Sources of inspiration for future experimentation include handwoven inkle trims, friendship bracelet designs, Norwegian-style trims. Exprimentation is low-cost. If you try a pattern and don't like it, FLB--stacked or single row--is easy to pull out. 3) To keep the columns of stacked FLB trim from spreading, or to prevent show-through of the background color, you can use a blunt-tipped yarn needle to draw a matching-color sock yarn back and forth under both arm of the chains. To avoid puckering, watch your tension as you draw the yarn under the chains. Stabilizing FLB by drawing a yarn under the chains. 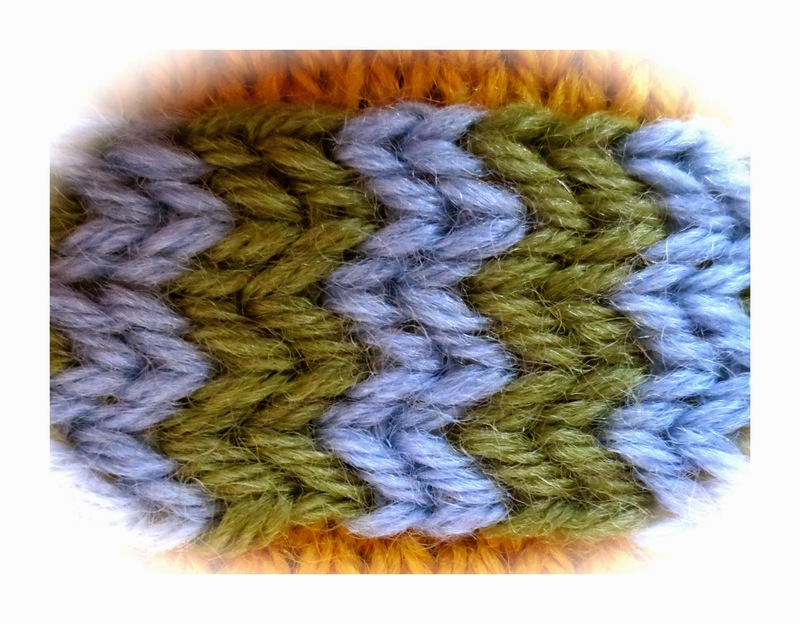 This particular FLB trim is the 1/1 zig zag, so the yarn is drawn under offset yarns of the same color. 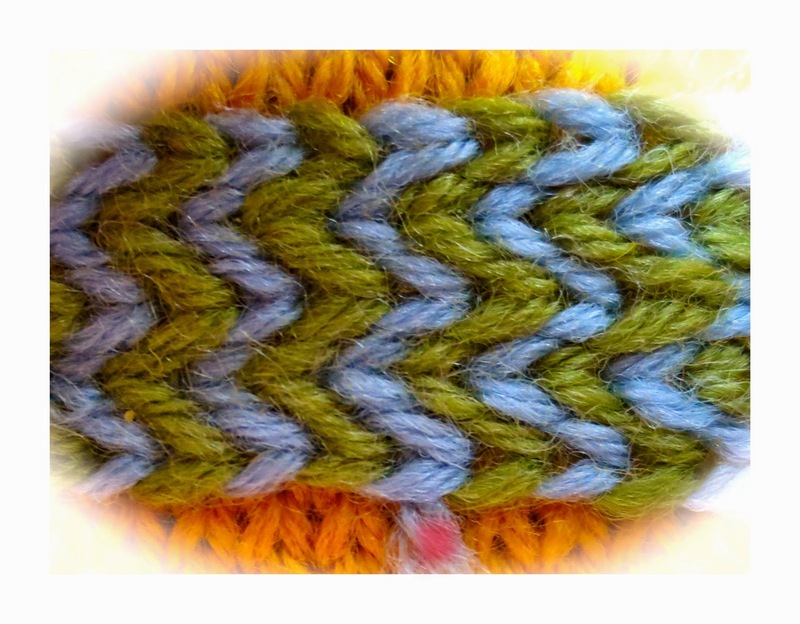 For non-zig zag trims, the yarn is drawn under straight (not offset) columns. 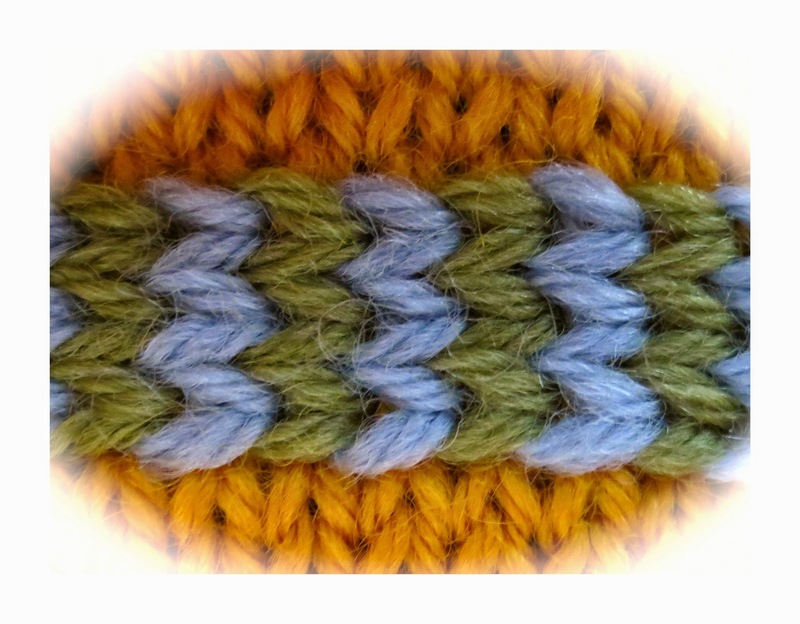 When you do this on a zig-zag trim, as shown above, the different colors are offset in different columns. Nevertheless, the trick here is to draw the yarn through these offset columns of the same color, because that sets the zig-zag. 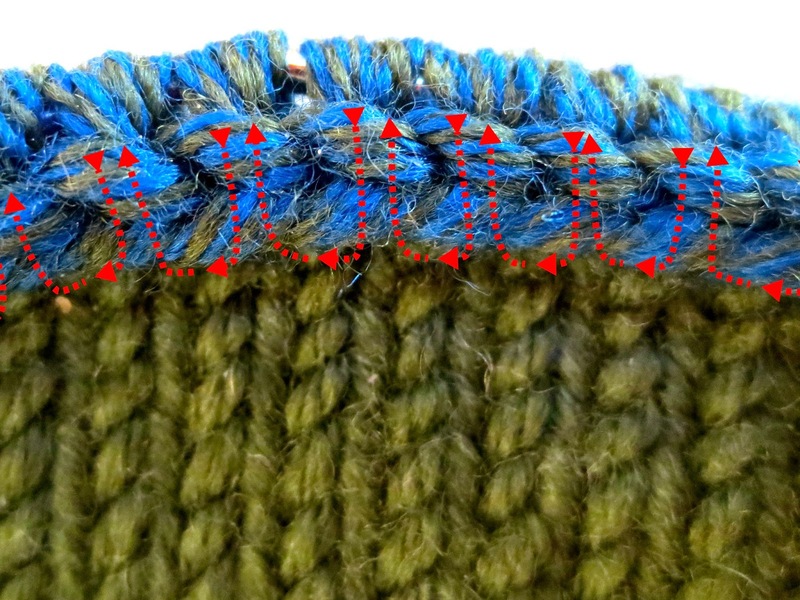 As an example, the needle is inserted through all the green stitches, despite the fact that the green stitches are offset one column. 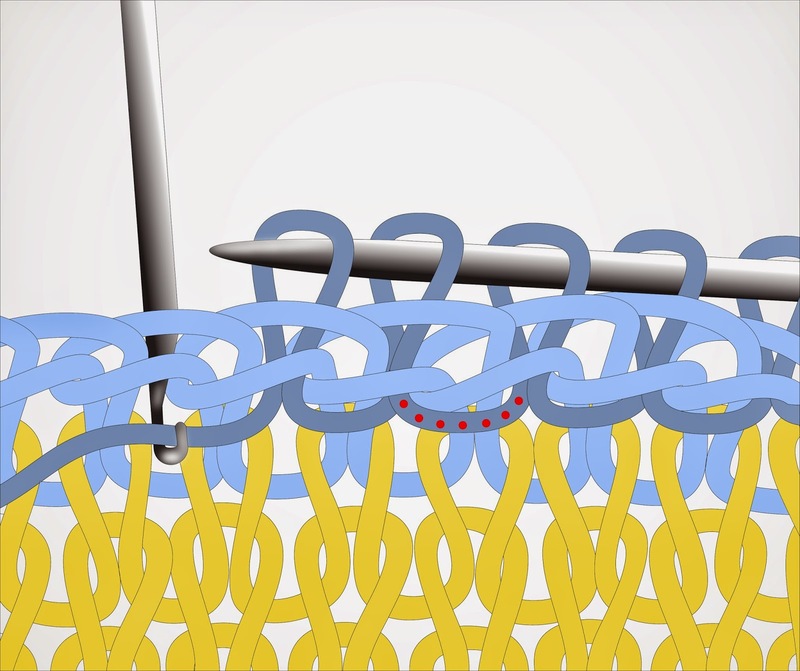 The resulting track of the yarn is shown by the zig-zag dotted red line. Does it work? See for yourself: in the beauty-shot of this 1/1 zig zag above, the zig zag to the left of the colored red tail has been "set" in this way, the fabric to the right has not. 4) It is also possible to stabilize stacked FLB from the back, as shown below. 5) Two-way FLB is easiest to work by rotating the fabric between rows going in opposite directions. Yet, when working on rotated fabric, it's easy to mistake where to insert the hook, since stockinette fabric upside-down looks to be half-a-stitch off the way it looks right side-up. See for yourself: The right side-up fabric is to the L in each of the below photo-series has a little green dot in the lower R corner. When the fabric is rotated 180 degrees (upside-down) the green dot rotates to the upper L corner. 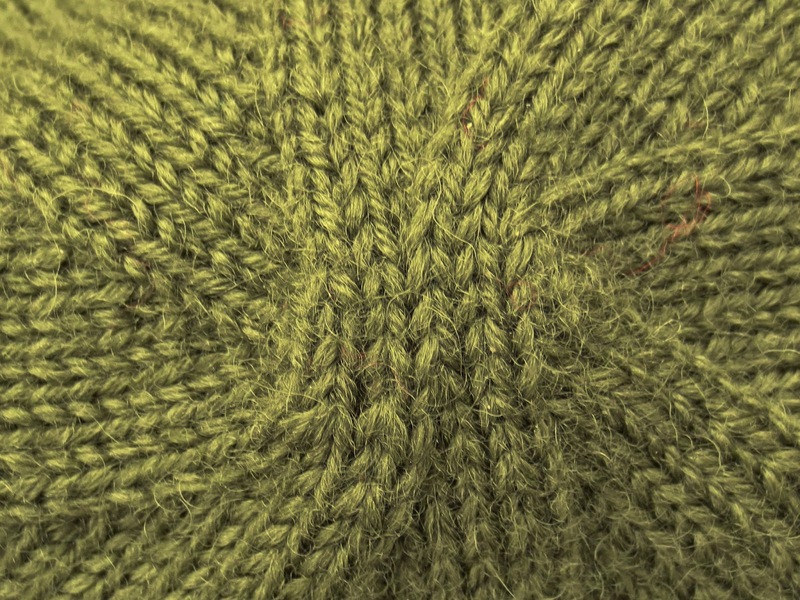 On both orientations, stockinette fabric appears as a "V," although on the upside down fabric (green dot at upper L) the V appears a half-column over. 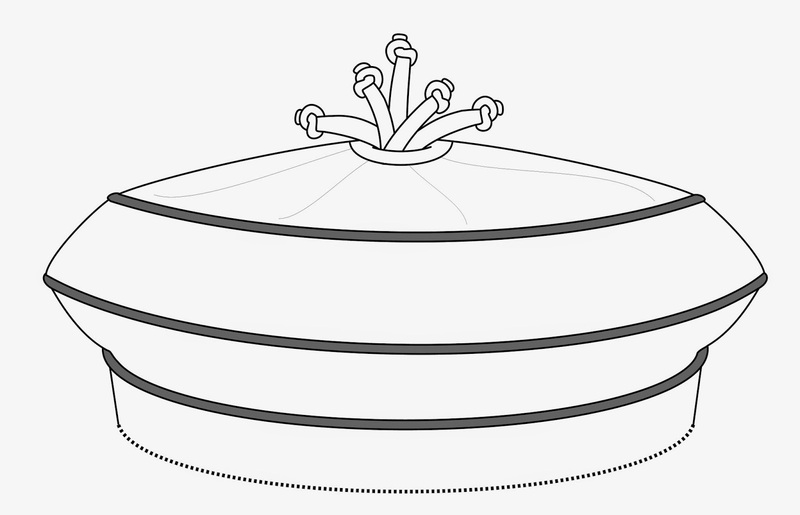 If you were to work an FLB on rotated fabric based on the appearance of the V, the FLB would also be a half-stitch off an FLB worked on un-rotated fabric. 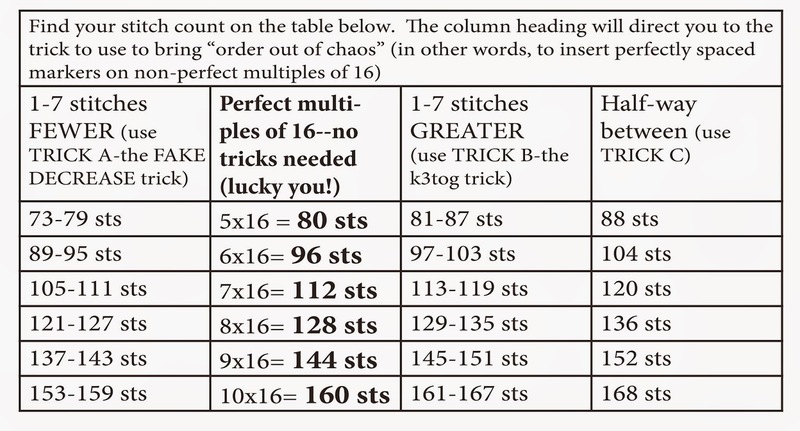 In other words, the stitches of adjacent FLB rows would not align in the columns. 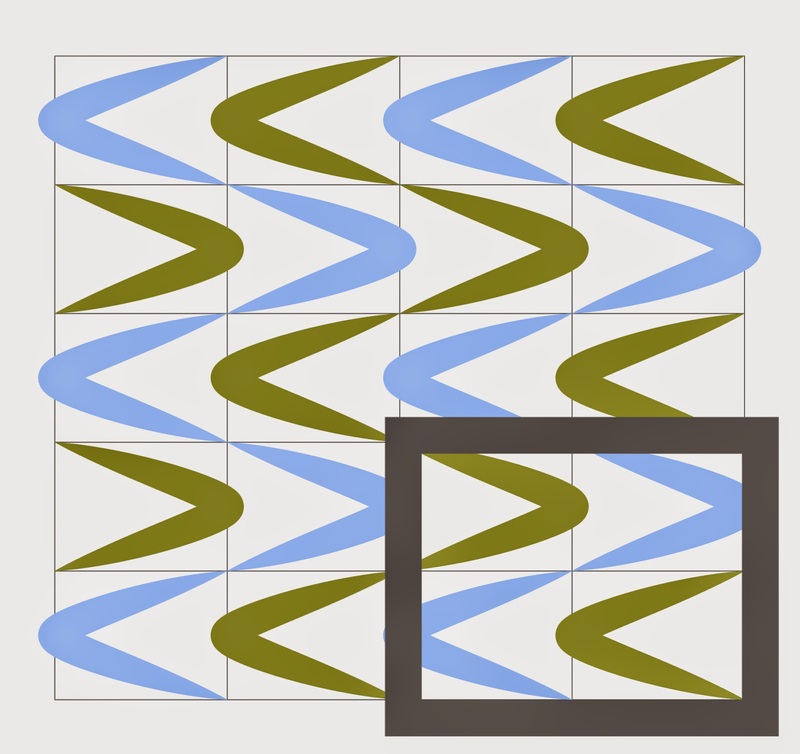 You can solve this problem without having to mentally turn each V upside down if you use a quilter's magic marker (color fades in an hour) to mark the center of the stitches. When you turn a marked fabric upside down, it's easy to see where to insert the needles: the V's upside down (^'s) are easy to pick out via the dots. 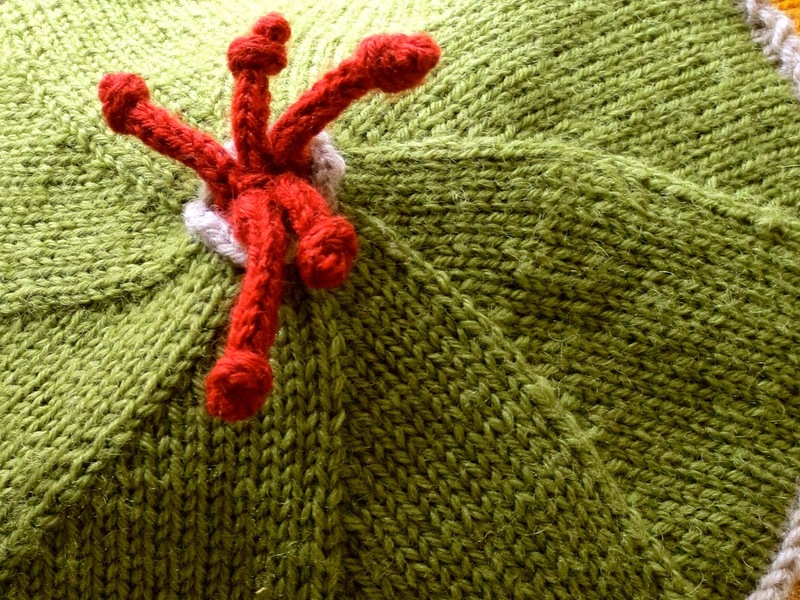 Refresh a tired sweater without unpicking a single stitch. Correct sagging: single-line or stacked FLB trim is quite firm, so any amount of sagging in cuffs, bands or facings can be quickly, beautifully and permanently corrected. New items decorated with FLB simply won't sag in the first place. Firm up too-loose garments: add a waistband to a saggy sweater, tighten a stretched mitten. Combat stretched-out seams and bands: Stretching hat bands, sagging shoulder seams and stretched out neck-backs are all gone with FLB. Make a matching belt to your sweater: stacked FLB will stabilize even a narrow fabric from rolling or stretching, especially if you stabilize the fabric per pro tip 3, above, then hide the back with a facing. Alternatively, you could make FLB reversible, by working some rows on the fabric front, and some on the fabric back--when the back of a chain shows, it makes a "stitched pattern" as shown in the third photo from the top, and this could be adapted as part of your design. Combat stockinette roll: as stated above in pro tip 3, a line of FLB worked along a ribbing/stockinette boundary combats band flip. It is also possible to tame stockinette roll with a multi-row trim right along the fabric bottom where the flip is. How many rows/rounds you have to work depends on how bad the flip is, but a 5- or 7-row trim usually flattens out even the most determined flip. Glitz it up: Add gold and silver yarn (or even metallised embroidery yarn) on a black mohair sweater=evening wear from an otherwise plain knit.